WSPHP is a tiny and fast server which adds Websocket functionality to PHP. X-NetStat is a program that displays information on your current Internet and network connections, much like the console netstat.exe program, but in a graphical interface. These connections are established each time you visit a web page, send an ICQ message, check your email, or anytime you do network activity that requires you to connect to another computer. They also appear when outside computers attempt to connect to your machine, authorized or not. Each connection is displayed in the Connection Table, where you can see the address you are connected to, what ports (local and remote) are being used, the connection status, and how long the connection has been active, and the process EXE behind each connection. The program can forcefully kill connections, copy connection information to the clipboard, minimize the application to the system tray, show bytes in/out, and more. X-NetStat Professional displays information on your current Internet and network connections in a graphical interface. These connections are established each time you visit a web page, send an instant message, check your email, or anytime you do network activity that requires you to connect to another computer. They also appear when outside computers attempt to connect to your machine, authorized or not. Information shown includes local and remote addresses, local and remote ports, the status, the age of the connection, how much bandwidth/traffic the connection is using, and the program EXE behind it. It’s kind of like Internet/network radar, and you can even kill or ban unwanted connections. The Professional edition of X-NetStat offers a ton of additional features geared towards Network Administrators, like a Rules system to set up actions based on network conditions, a comprehensive Network Statistics window displaying information on network interfaces and protocols, a server that lets you access XNS information remotely, a collection of Lookup Tools (TraceRoute, WHOIS, Finger, DNS, Web Search, Server Version, NetBIOS Lookup, Online Tools, etc), a Port Database, Logging capabilities, transmission LED lights, a dockable ViewBar, and many more features. Moonlight21 – Auto Redial for Skype is a Skype Extra, the will redial automatic when outgoing call was fail, you can set the repeat time and how many seconds to wait between tries on application, It’s useful tool for your Skype. May 19, 2016 Internet, Software, Tools & UtilitiesOctopus Data Inc.
Octoparse is a powerful but easy-to-use web scraping tool that is being used by tens of thousands of individuals and companies all over the world. The word of Octoparse is the combination of the two words, ‘Octopus’ and ‘Parse’. This implies that Octoparse can extract and parse data around the vast ‘Internet’ ocean just like an octopus. Octoparse turns unstructured web content into structured data, and then save the data in one format of your choices, such as Excel, Txt, Html, even upload the data directly to database server. 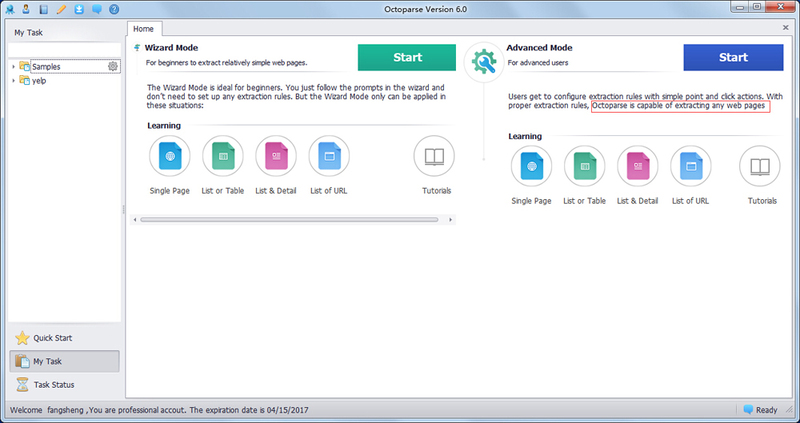 Octoparse has two modes, Wizard Mode and Advanced Mode. The former leads you step by step to grab any data you want. For more complicated web pages, you need to use its Advanced Mode which provides a lot more advanced features. With Octoparse, you can easily extract any visible web data from almost any web pages, for example, capture information from blog, forum, news, and all kinds of industry websites etc. Moreover, Octoparse features cloud data extraction. Multiple cloud servers can work 24 hours a day and 7 days a week all the year to help you speed up the process of data extraction so that you can get large-scale web page data you exactly want in a much faster way. March 19, 2016 Internet, Software, Tools & UtilitiesKingsoft Office Co. Ltd.
Windows Mysite Search V 1.5 Easily check sites for your link or text. Great for making sure your recip or link is still up on a site that you traded links with! Note : You Must adjust your anti-virus setting to EXclude this software from sonar ,just a couple of clicks and your done.! Please note: these are free downloads but you still need to purchase the Regkey serial number key for unlocking your software,to finish the install process. All : Windows, including Windows 8, & 8.1 /7,ME,XP, VISTA,2000. Windows Link Status V 5.7 Link Status is a easy to use tool that will allow you to grab all the links on your website and see that they are not dead. Or you can use it to check other sites to see if your link is still there. Note : You Must adjust your anti-virus setting to EXclude this software,just a couple of clicks and your done.! Please note: these are free downloads but you still need to purchase the Regkey serial number key for unlocking your software,to finish the install process. All : Windows, including Windows 8, & 8.1 /7,ME,XP, VISTA,2000. Windows Traffic Wizard V8.4 Traffic Wizard is packed with 10 script Generators ,with one click botton ,which are easy to use to increase website trafficRight from your desktop, These scripts include Break Frames, Bookmark Us, Email This Page, Set Homepage, Logo Branding, Frameless Popup, Browser Entry, Language (which routes traffic based on browser language settings), Avenue Search, and Popup Page,Just Select what you want click and it automaticly gives you the code to put in your page with simply instructions. Its that simple!. Please note: these are free downloads but you still need to purchase the Regkey serial number key for unlocking your software,to finish the install process. All : Windows, including Windows 8, & 8.1 /7,ME,XP, VISTA,2000.